You are here: Home / About Us / How to plan Cayman Islands Destination Wedding? Today I thought I would give brides and grooms a few pointers for getting married in the Cayman Islands. Over 90% of brides research weddings on the internet. Start by typing in “wedding”, and “Grand Cayman”, or “Cayman Islands”. You will find lots of wedding planners, and hotels with wedding planning services. 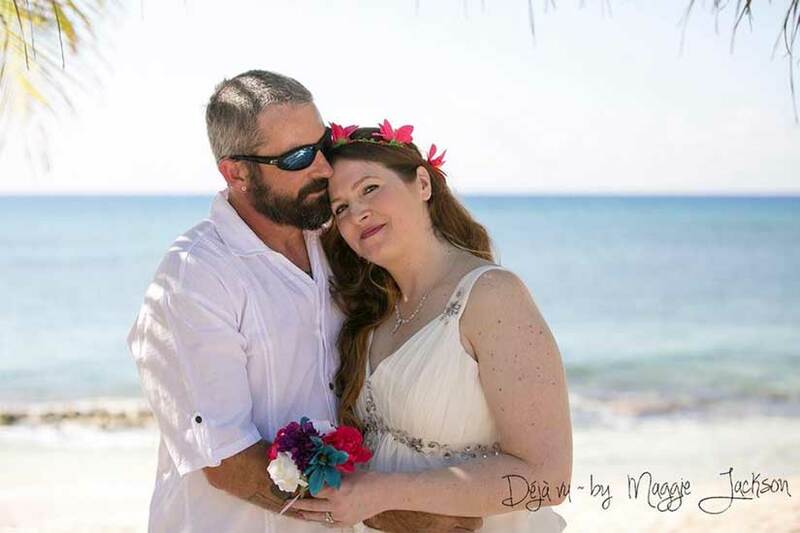 If you typed “getting married in Grand Cayman/Cayman Islands” you will get a list of all the requirements, but there is no need for you to go down to the marriage bureau to get your Special Marriage License, as your wedding officiant or marriage officer will do that for you at no additional cost. So your first step is to find a wedding planner, or a wedding officiant. Some full service companies like my company Simply Weddings, provide both. A wedding planner or wedding consultant is an intelligent choice for a destination wedding, since he or she will know the best local wedding vendors and can make the best deals. Establish a budget for your Destination Wedding. If you are coming by cruise ship, an all-inclusive wedding package which includes transportation for you and your guests may be your best option and will take the stress out of moving your guests from the cruise ship landing to the wedding location and back. If you are a stay-over visitor, you should factor in transportation either a cab, a town-car or a limousine. You really don’t want to be driving on an unfamiliar road after your wedding dinner or celebration. Be sure to tell your wedding planner what is important to you, and what you can compromise on. If you want a deserted beach for example you might have to pay time and travel costs, but a quiet beach on a different part of the island might have no additional costs. If you want a particular floral arrangement, send the images to your wedding planner, but expect to pay mainland US prices plus 20%, remember all cut flowers are imported into the islands and attract import duty. Your wedding officiant should be able to send you a script of the ceremony well in advance so you can negotiate any changes you wish to make. Simply Weddings will only send the script after you have booked your wedding, as our ceremonies are trade-marked in the Cayman Islands. If you are traveling as a couple with no guests, make sure your wedding planner knows so he/she can arrange the two witnesses requires by law. You should expect to tip each witness provided by your wedding planner $20, if they have come out specially. Be sure to provide the required documents to your wedding planner/wedding officiant well in advance. You can mail or scan the picture page of your passports (colour is better) and any divorce decrees (every single page). The marriage bureau does not accept facsimiles (faxed copies), and your wedding officiant won’t either. The marriage bureau is not open on weekends, or the ten annual Public Holidays in the Cayman Islands. Your wedding planner/wedding officiant can make special arrangements with the government authorities to get your Special Marriage License. (we want your business). Bring whatever you plan to wear to the wedding, and pack it 15 days in advance so you’re sure not to forget anything. Being spontaneous is nice, but when we want to buy clothes for a wedding we go to the USA. There is very limited choice here. Book a photographer. Today’s digital cameras are great, but things happen to digital cameras when you move from air-conditioned cars and rooms to the hot beach. Don’t gamble with your wedding pictures. Don’t give a friend the responsibility of doing the official pictures, unless you have made an official arrangement. If you want a “name” photographer, say so. You can usually get any photographer you want, for an additional cost to your package. If you want a wedding cake, say so. Sometimes you can switch around things in your package so that there is no additional cost for a cake. Be thoughtful, and treat your wedding vendors as the professionals they are. Poor service, when it happens unavoidably sometimes, should be compensated for by an apology, a rebate or some small token of appreciation from your wedding planner. Good service should be acknowledged by a note or email, in my case I like comments on my blog. Always say goodbye and thank the people who have contributed to your special day.